Seven Eleven is known for their energetic live performances in the tradition of the great P-funk masters. Get ‘m down! contains recordings of the band that go back to daddy Dulfer\'s streetbeat show for VPRO-radio in 1994, to recordings of the Funk to the Max party in the Melkweg in 1999 with special guest Gary Mudbone Cooper (Bootsy\'s Rubber Band). All this stuff has been reworked, remixed and produced by Seven Eleven’s regular workmate handieMan Maurice, one of the best triphop- and funkproducers in the world. The result is slammin’ with the horn section most of the time stealing the show. They play excellent in tracks like 'Hell' and 'Scientific Failure', that lasts for about eight minutes and should be played in the repeat mode. 'Fred', with organ and (again) irresistable horns, is dedicated to Fred Wesley. Seven Eleven is THE funkband of Europe. I like it very much, love their music. Get'm Down is a perfect funk cd if you wanna check it europe's finest funkband. 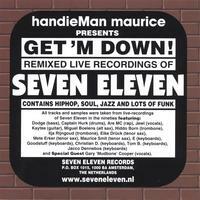 On www.seveneleven.nl you can order 2 new cd's; Hot 'n Funky and Live in Paris. I love them even more then the others... check it out funkpeople!